I am a happy girl. My first offering for “Easter Basket Week” is in the oven (to be posted tomorrow) and I just had the most amazing dinner. Now that I’ve eaten it, I am a little conflicted. 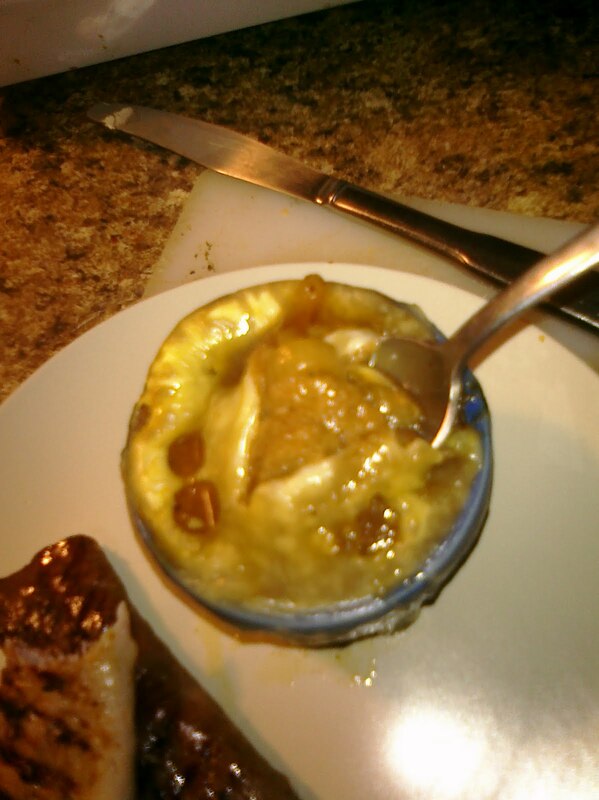 I don’t know whether to call this French Onion Soup or a deconstructed French Dip sandwich. 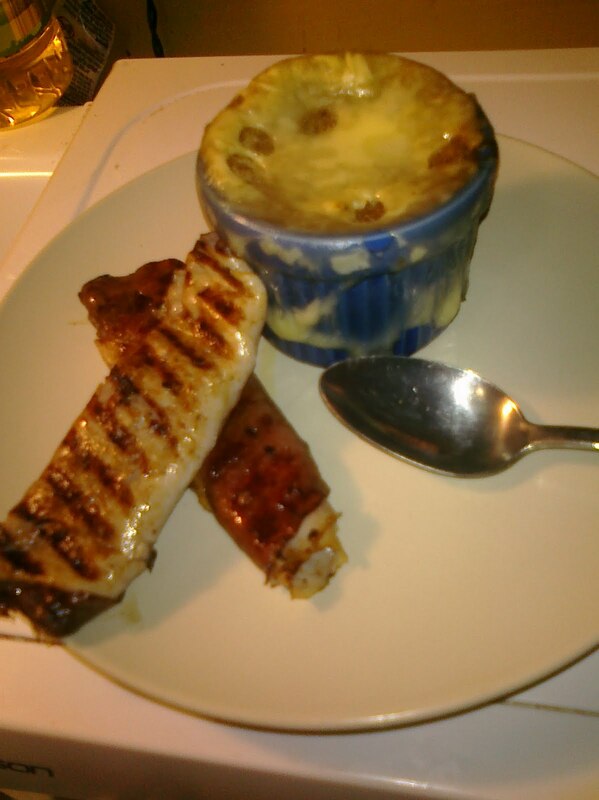 I guess since there is lots of onion love in the soup I better call it onion soup. Whatever you call it, it is “eyes rolled back in your head” good! Melt your butter in a pan and add onion rings. Cook on low heat for about 15-20 minutes. 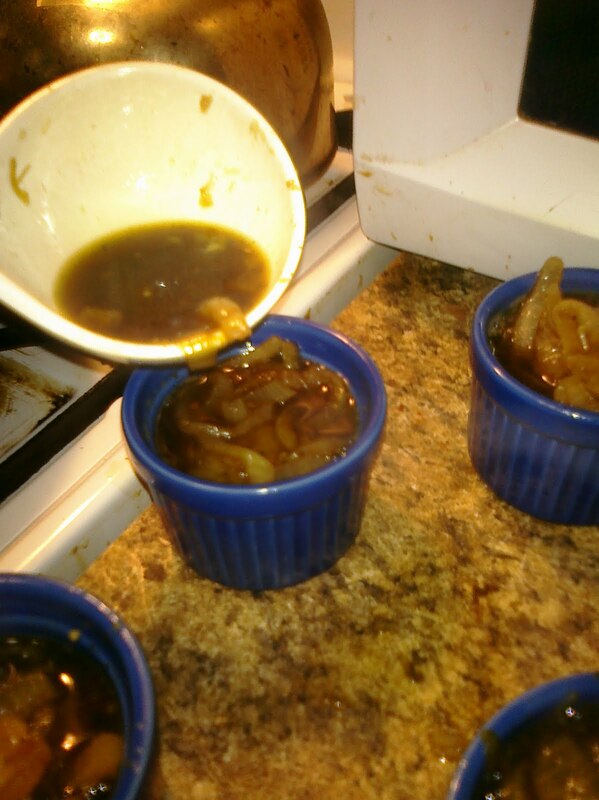 You have to do it “low and slow” so the butter doesn’t burn, but you want a good caramelization on your onions. About halfway through cooking add your Worcestershire sauce and garlic and stir. Don’t get worried if your pan gets dry and cruddy. Crud is a good thing. 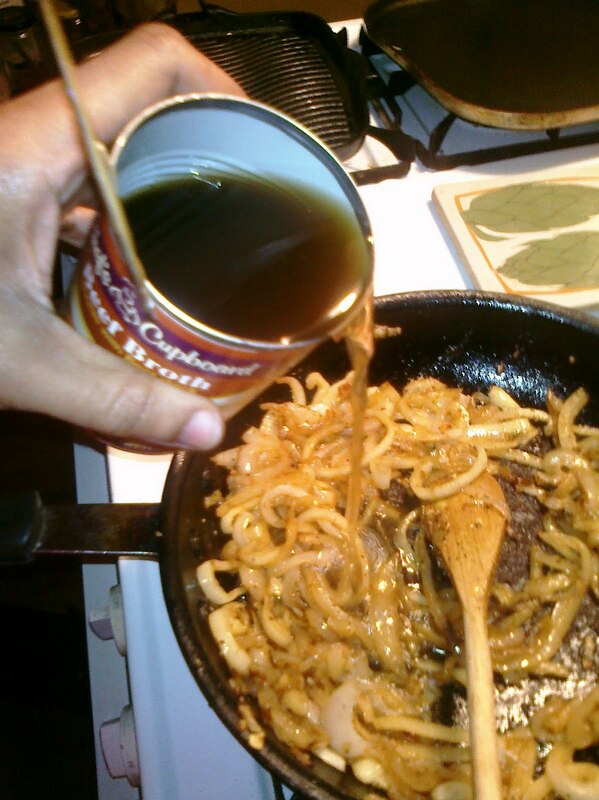 Slowly add beef broth, stirring with a wooden spoon to pick the crud up off the bottom of the pan. Bring that to a boil and reduce to a simmer. Spray it down with low or no-cal butter spray and sprinkle it with garlic powder and then pop it in your toaster oven (or oven set to 350) and toast HARD. And yes…I do mean hard. You don’t want it burnt but it should be decided coaster-like. 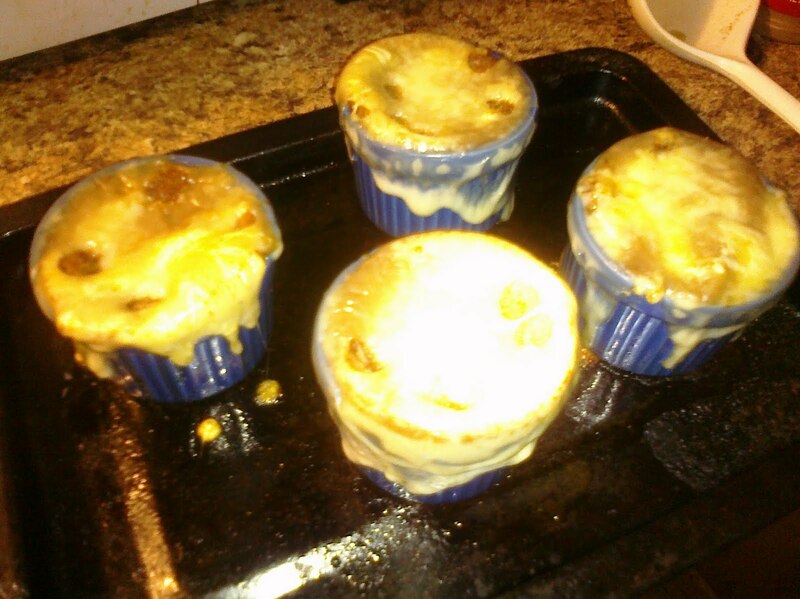 Meanwhile ladle soup into bowls…ramekins…whatever. When the croutons are done, place them on top of the soup and place a piece of cheese on top of that. 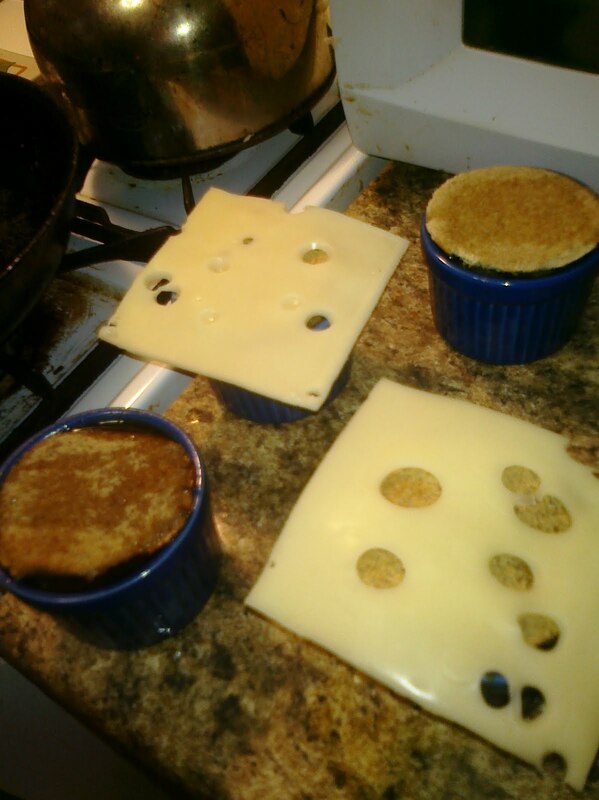 Arrange your ramekins on a cookie sheet and pop them back into your toaster oven (or oven) for an additional 10 minutes or until the cheese is melted. Oh my YUM! I love this soup. It’s so easy. And it allows me to taste beef without eating a bunch of it. To keep things “in the spirit” I served this with grilled lunchmeat roll-ups that had roast beef in them (deli cut beef seems to be the only kind the pouch likes). And Swiss cheese when it is melted is…simply divine. Sigh…ok…if this is day one of my vacation from work, y’all. Good Lordy, what could be in store next??? Ohhh sounds heavenly! 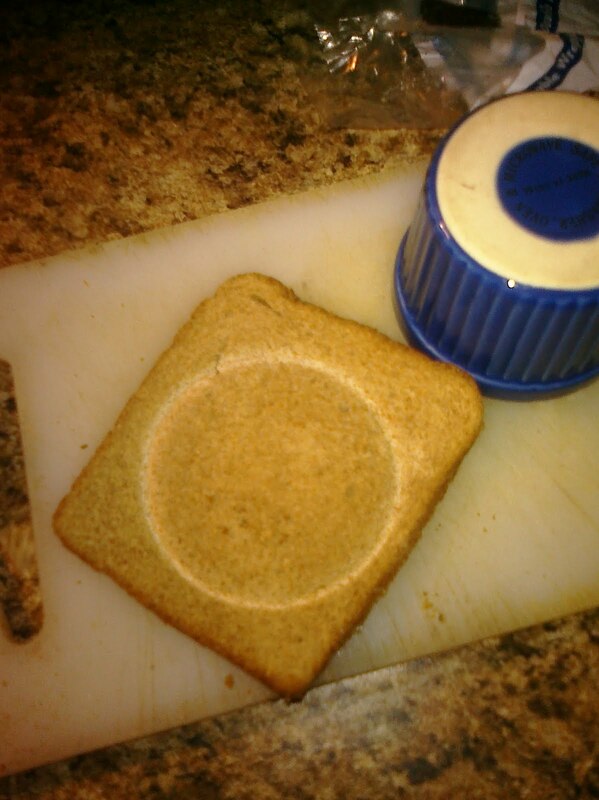 Will have to try it out once I buy some ramekins. Have to leave the bread out…I'm too soon post-op but boy the soup sounds amazing as do the deli rolls YUM! YUM!!! I ♡ French Onion Soup!! I will be making this soon! !